Unbeknownst to the world, Microsoft somehow enabled video to play across slides again! 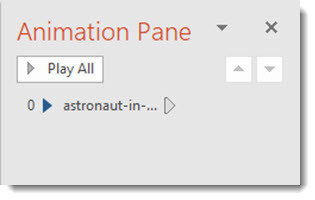 This is something I have been requesting since the release of PowerPoint 2010, when video-across-slides stopped working. But don’t get too excited, there are limitations in using it today. First the technical note: I am using Office 365, PowerPoint 2016 on Windows 10. This is untested on legacy versions or the Mac version. Here is my sample slide deck; 5 slides with a video on slide 1 and indicator text on balance of slides. 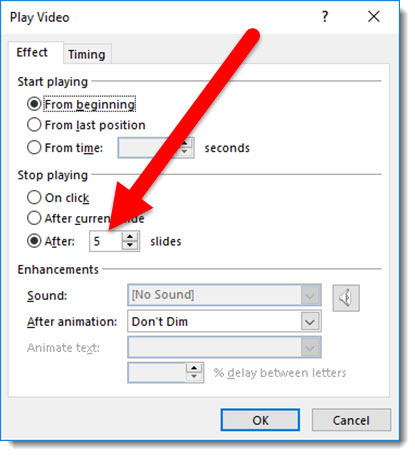 Back in PowerPoint 2003, a video could be set to continue playing across slides and it would! The reason was more of a limitation of PowerPoint that users were able to exploit and make a good thing. Back in PowerPoint 2003 video was not embedded and ran as a separate video player layer on top of PowerPoint. The good news was PowerPoint could keep the external video player going across multiple slides. The bad news was among other things, no PowerPoint content could be on top of the video while it was playing, because it was on top of the slides when playing. 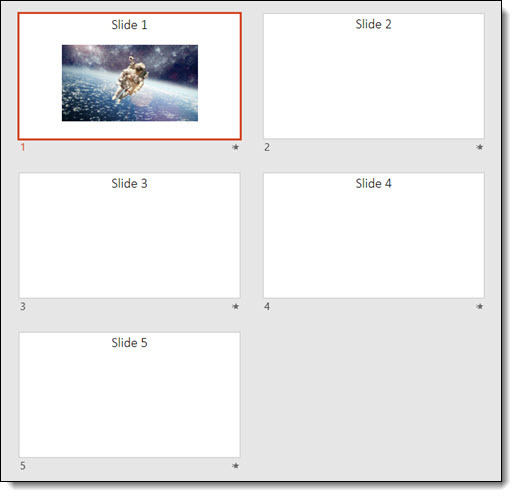 When the play across multiple slides option is selected for a video, the video uses a legacy video player and reverts back to the PowerPoint 2003 model of being a layer on top of PowerPoint. So yes, you can play a video across slides, but the video has a lot of styling limitations. Don’t count on this working in the future. It was broken for years and suddenly started working (thanks to Taylor Croonquist for mentioning it!). It could easily stop working with another update (and the ultimate update would be to enable video to play-across-slides AND maintain the embedded video player for z-order control and styling effects!!). But don’t hesitate to use it if needed. I was recently used a 60 second countdown video to play across a series of slides and all worked perfect (but the request was a circle shaped clock, which I could not do because of the above noted styling limitations). I tested on my show computers and was confident all would work for the meeting. If the same client asks for the same effect next year, I cannot promise it will work until we are close to the meeting date and I can test and confirm it is still a supported feature (eg. I am not sending out Sales Team decks using this feature, because it would be bad for things to stop working in the future). Thanks for documenting how to do this! I see it working in Powerpoint 16 for Windows but not Powerpoint 16 for Mac, which is ok for me as I’ve got both. However, even though playing a video across slides this way does work fine in the slide deck, I’m unable to get the effect when I export the whole deck to mp4 to play as a video itself. Instead, the video disappears after the first slide, and only the audio keeps playing. I’m trying to create a “screen within a screen” effect in the exported mp4 video, with the a presenter’s video-recorded narration of the slide deck overlaid across the slides themselves, and with ppt’s timings set so that the slides advance at the correct times throughout the presenter’s recorded narration. Are others encountering this limitation, as well? My goal is to create several of these kinds of files, to use for an e-learning course. If powerpoint itself can’t accomplish this, could anyone suggest what video tools might be used to create this result — using either the ppt deck for the slide images, or exporting those separately to jpegs and using them as b-roll footage along with the original presenter mp4? Adobe Premiere Pro maybe? Almost a year later – did you ever figure this out? I am struggling myself – video disappears but audio plays. I’m using PP on Mac. Audio with no video is almost always a video codec issue. Options are updating/adding video codecs to computer or re-encoding video to a known/standard format (even if the video says .mp4 or .wmv, etc. there can be nonstandard setting hidden inside). getting a video to work seamlessly across multiple slides has always been an easy task using master slides or not. You will impress me most if you can show me how to incorporate text across multiple slides as the seamless video runs in the background. It never ceases to amaze me how across the entire world of PP, nobody has ever really needed or wanted to do that to the point MS realizes the need and re-establishes the option like they had before 2010. Unfortunately no solution (much to my frustration!). The behind the scenes issue is the video play system no used gives us the video styling options (reflection, change shape, etc. ), but lost the ability to play video across slides (see this blog post where I ranted a bit more: http://www.thepowerpointblog.com/video-across-slides/).